SUMMARY: Everyone believes in something. Almost everyone. For Sanskrit Aaron Zuckerman, it isn't easy to believe. Especially when all the people you care about leave. His Dad left after the divorce. The love of his life left in second grade. His best friend in Jewish school found God and practically left the planet. Now his yoga teacher Mom is falling in love with her spiritual guru, and she’s threatening to leave, too. Hilarious yet with a great depth to it, Since You Left Me blends religion, coming of age, family in a fabulous way. Sanskrit is an awesome character, with an honesty to him that makes him so relatable. With some rougher scenes mixed into an overall funny story, this is one of those books about just generally figuring things out that had me hooked. Sanskrit cracked me up, from the kind of different but interesting way he saw the world to the stream of consciousness that helped bring the narration to life. A student at a Jewish high school, Sanskrit has sound reasons for why he has trouble with his faith, and some pretty big things testing him throughout the book. There is more to him and the book, however, than his questions about his religion, and each element is blended not only into the book but into his development as well. Sanskrit is so easy to like and root for. I loved this guy, even when he’s less than perfect. There is a relatively large cast of characters in this one, from the girl Sanskrit wants to date to his sister and mother, as well as a good friend of his, and the guru who really stirs things up, yet Zadoff brings each character to life. The different ways Sanskrit acts with each one beautifully showcases not only who he is but where he’s at in life, without falling into stereotypes or boring interactions. With some deeply emotional scenes mixed into the book, and hitting not only Sanskrit but readers where it hurts the most, this book has a great character element that truly makes it stand out. This is one of those books that, when picked apart, has an almost unbelievable plot. Though maybe requiring at least some level of suspension of disbelief, there is still a strongly realistic element to this book that is so easy to fall into. 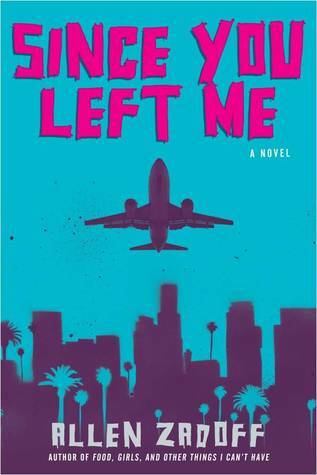 Entertaining and fun, yet also a book that will make readers think, Since You Left Me is the best kind of contemporary. The religion part of this book is one of my favorite aspects. Sanskrit struggles with his faith in a way that is not only open and honest, but is far from judgmental, agenda-pushing, or even offensive. But what makes it even better to me is the way Zadoff plays both the way Sanskrit is raised and what he’s been taught off each other. Add in the awesome writing, so to the point yet able to pull the reader right in, and Since You Left Me is a witty twist on feeling out of place and unsure. I have this for review and your review is really getting me excited about it. I was interested in it initially because of the cover and having read Zadoff's previous works but now it sounds even better. Thanks for the review!